Thanks again to Rachel at Book Snob for the photo. I couldn’t believe my luck in getting a copy of this out of print Whipple. I thought that I would hold onto it for a while–save it for a rainy day if you will–but I think I had it for only about a week before giving in. As with all Whipples, Because of the Lockwoods is a wonderful book and a wonderful read. I ended up staying up to almost 2:00 AM (on a work night!) to finish it. The story centers around the Hunters (mother and three children) and their diminished circumstances after husband/father passes away. The Lockwoods, the Hunters’ previous neighbors, appear to be, and certainly think of themselves as a benevolent force in the lives of the Hunter family. Mrs. Lockwood insists that Mr. Lockwood help Mrs. Hunter make sense of her husband’s estate. In the process Mr. Lockwood perpetrates a swindle upon Mrs. Hunter that further diminishes her circumstances. The swindle, however, is not appartent to Mrs. Hunter and she lives her life in perpetual gratitude and obesiance to the Lockwoods. With very few resources to fall back on, the two eldest Hunter children are eventually forced into accepting jobs they abhor because the seemingly munificent Lockwoods insist that they have no other prospects. But Thea, the youngest, manages to pursue her dreams both despite and because of the Lockwoods. In the process she finds herself a social pariah and her hopes for the future dashed. That is until working class neighbor Oliver Reade manages to provide opportunities for the upper class Hunters that they never would have expected or contemplated. Still, I loved Because of the Lockwoods. I am chuffed to note that I have a copy of Every Good Deed coming from an ebay buy in Australia and that Persephone will be reissuing Greenbanks soon. And by the way, has anyone else noticed a superficial similarity between Because of the Lockwoods and Barbara Comyns’ The Skin Chairs? Diminished circumstances, telling off the snooty folks who were supposedly their benefactors, the self-made man rescuing the family from drudgery? Can you believe I've never read any Whipple. Shame!! Like reviewsbylola above, I've never read Dorothy Whipple book yet. I certainly want to and I think I better do so sooner rather than later lest her other books go the way of Becausethe Lockwoods. Although because of Persephone that may not happen. Anyway, this sounds like a wonderfully enjoyable story although I don't like The Lockwoods much at all. Of course, I am quite intrigued about Thea as well as about the dark thread you refer to towards the end of your review. Loved your review and the picture is wonderful! I'll be keeping an eye out for your eventual review of Every Good Deed. I adore Dorothy Whipple, but, like you, I am a bit let down that everything always turns out for the best at the end. I think that is why Noel Streatfeild's Saplings really stuck with me. Nothing turns out alright in that book (and, alas, that can be reality). Glad you enjoyed this Thomas! Did your copy have the endpapers you wanted? Every Good Deed is very good but incredibly short – just so you aren't disappointed when a super skinny book arrives. I think you've hit the nail on the head – the rosy endings do give the books a tweeness that has probably made her popularity suffer – as the postwar wish for cheer and comfort faded away, the wish for books that were more realist surely took over hence poor Dorothy being shunted off the shelves. Even so, for well written comfort reading, she cannot be beat! Greenbanks is her best. I am hopping with excitement for the reissue as I can't wait to have my own copy. I agree with you about the deus ex machina elements to most of Whipple's novels (the ones I have read) but, like Rachel above, concur that it is a contributing factor to what makes Whipple so comforting. I do think that there is always a slightly insidious thread running through most of her work; she exposes the uncomfortable despite being so comforting! Lucky you! I do own 2 books by Whipple and they are pretty high up in the TBR mound. This one sounds great! Lola: It just means you have something great to look forward to. Amy: Oooh, but the bad Lockwoods get their comeuppance. Amanda: I don't mind that they turn out good in the end. God knows I can use a happy ending from time to time. But it does subtract perhaps from her “greatness” as a writer. 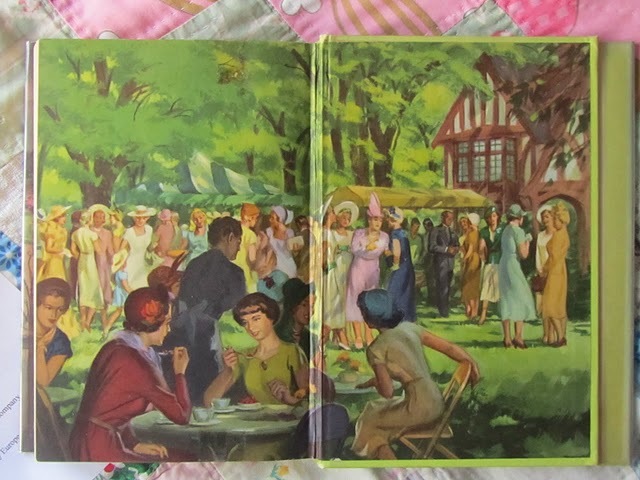 Rachel: It is indeed the one with the endpapers. Good to know about EGD. I would hate to be disappointed. Claire: Well I love stories where people overcome adversity. And her characters certainly do that. Diane: Save them for a time when you can really relish them.